In her recent book, Postcolonial Poetics, Elleke Boehmer sees world literature studies as assuming “a general interchangeability across cultural divides” (14). This has been one tendency in the field, but whether it describes the current state of world literature in the academy is debatable. 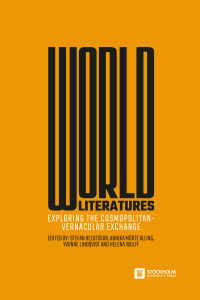 In our new publication, World Literatures: Exploring the Cosmopolitan-Vernacular Exchange, the intention has been different: to return to the rough ground of literature’s making of and being in the world. The plural in the title – “literatures” – gives a clue to our approach. World literature, we claim, is not one thing. However, many (possibly most) literatures have a “world” dimension. This is what we try to capture with the notion of the cosmopolitan-vernacular exchange: rather than focus exclusively on literature that circulates internationally, our interest lies in how literatures and literary works negotiate the push and pull of the local and the international, the vernacular and the cosmopolitan. The diversity of cases here – with connections to China, the Caribbean, India, Sweden, Russia, Kenya, and so on – doesn't add up to a whole, yet the cosmopolitan-vernacular optic sheds some light on them all. To say that World Literatures came about accidentally would be misleading. The contributors, after all, belong to a well-funded research programme here in Sweden. And yet, that it should become this particular book was not a foregone conclusion. Its beginnings were modest: soon after the research programme “Cosmopolitan and Vernacular Dynamics in World Literatures” kicked off in 2016, we decided to make an initial joint presentation of our research agendas. Something very simple – a few pages from each of the 26 scholars that served to delineate projects that would be developed in the years to come. Nothing more. But once we approached Stockholm University Press with this low-key idea, the stakes rose. Both the peer-review procedure and the contributors’ dedication to their topics added new layers of seriousness and complexity to the volume. Revisions were made, references updated. When we reached the proof-reading stage, perfectionism started to set in – which is not always a good thing. It was our ambition from the start to produce a volume that could be used in teaching, at least from the second-year level up. Its wide range of cases notwithstanding, I think it does the job not only of introducing a large amount of current research in the world literature field (broadly understood) but also of demonstrating how these perspectives can be applied, critiqued and further developed. Even so, it’s worth asking why World Literatures is needed, given the current flurry of “world literature” volumes. Three examples from 2018 chosen somewhat at random: May Hawas (ed. ), The Routledge Companion to World Literature and World History; Gesine Müller, Jorge J. Locane and Benjamin Loy (eds. ), Re-Mapping World Literature; Ben Etherington and Jarad Zimbler (eds. ), The Cambridge Companion to World Literature. One possible answer could be that we provide an angle on world literatures that is intentionally (and no doubt unintentionally) grounded in our regional location in Scandinavia. Another is that the volume has a more pronounced multilingual approach than has often been the case. Given that world literature, as a field of study, can only ever function as a meeting place and a collective endeavour, these are two small contributions to a rapidly unfolding conversation. But it’s not really for me to answer the question. If you wish, you can decide for yourself instead. The best part is that it’s an open access publication – you simply need to download the book here.